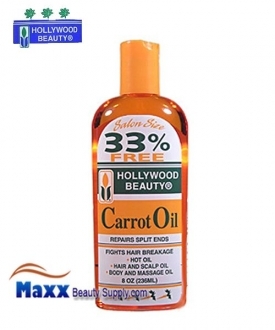 Carrot oil will penetrate the hair shaft and help repair damaged hair. Repairs split ends. Fights hair breakage. Hot oil. Hair and scalp oil. Body & massage oil. For Hair Breakage: Apply small amounts directly to hair and scalp, gently massage. Carrot Oil will penetrate the hair shaft and help repair damaged hair. Hot Oil: First heat oil by placing bottle in a cup of warm water. Apply evenly throughout your hair and scalp. Cover hair with warm moist towel for five minutes then rinse and style. Use the warmed oil to moisten your skin and nail cuticles. External use only. Hair burns. Keep away from sparks or flame. Keep out of eyes and mouth. If eye contact occurs, rinse thoroughly with water. If scalp condition fails to improve or worsens, discontinue use and consult a physician. Soybean Oil (Glycine Soja), Safflower Oil (Carthamus Tinctorius), Carrot Seed Oil (Daucus Carota Sativa), Aloe Barbadensis Leaf Extract, Vitamin E (Tocopherol Acetate), Cholesterol, Hydrolyzed Keratin Proteins, Horestail Extract (Equisetum Hiemale), Rose Hips Oil (Rosa Canina Fruit), Pecan Seed Oil (Carya Illinoensis), BHA.